Quick and easy pop up assembly. Folds away flat for compact, portable storage. Features main roll up door, side entrance with tie backs and back entrance (ideal for connection to play tunnel). Sewn in ground sheet for indoor and outdoor use. Promotes physical activity and hours of active fun. Size: 75L x 75W x 90H cm…. This toy costs approximately £9.99 (for the latest and best prices make sure you check our retailer list for the Pink Pop Up Play Tent above). 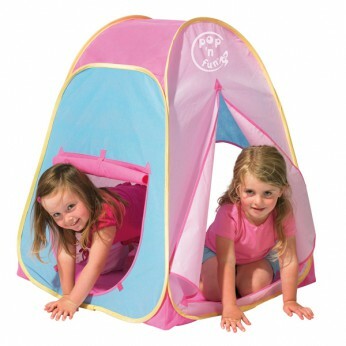 In our review of Pink Pop Up Play Tent we classed it as being suitable for ages 3 years, 4 years, 5 years but recommend you check the manufacturer specific advice before purchasing.